Apply the filter in reverse to the given data. Minimum Mean Square Error (Wiener) inverse filter. Return local median of an image. Find the edge magnitude using the Sobel transform. Find the horizontal edges of an image using the Sobel transform. 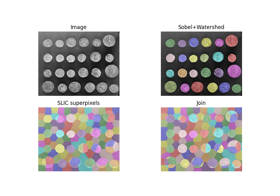 Find the vertical edges of an image using the Sobel transform. Find the edge magnitude using the Scharr transform. Find the horizontal edges of an image using the Scharr transform. Find the vertical edges of an image using the Scharr transform. Find the edge magnitude using the Prewitt transform. Find the horizontal edges of an image using the Prewitt transform. Find the vertical edges of an image using the Prewitt transform. Find the edge magnitude using Roberts’ cross operator. Find the cross edges of an image using Roberts’ cross operator. Find the cross edges of an image using the Roberts’ Cross operator. 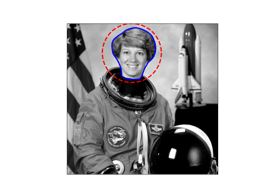 Find the edges of an image using the Laplace operator. 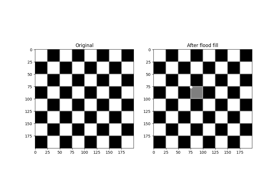 Return an image of the same shape where each pixel is the index of the pixel value in the ascending order of the unique values of image , aka the rank-order value. 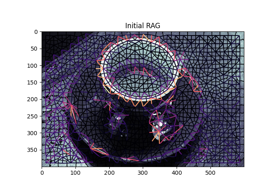 Return complex 2D Gabor filter kernel. Return real and imaginary responses to Gabor filter. 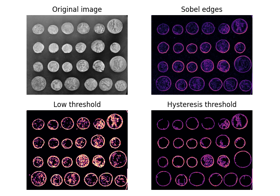 Returns a figure comparing the outputs of different thresholding methods. Filter an image with the Meijering neuriteness filter. Filter an image with the Sato tubeness filter. Filter an image with the Frangi vesselness filter. Filter an image with the Hybrid Hessian filter. Return threshold value based on Otsu’s method. Return threshold value based on Yen’s method. Return threshold value(s) based on ISODATA method. Compute threshold value by Li’s iterative Minimum Cross Entropy method. Compute a threshold mask image based on local pixel neighborhood. Return threshold value based on minimum method. Return threshold value based on the mean of grayscale values. Applies Niblack local threshold to an array. Applies Sauvola local threshold to an array. Return threshold value based on the triangle algorithm. Apply hysteresis thresholding to image . Impulse response of the filter. See LPIFilter2D.__init__. Additional keyword parameters to the impulse_response function. Limit the filter gain. Often, the filter contains zeros, which would cause the inverse filter to have infinite gain. High gain causes amplification of artefacts, so a conservative limit is recommended. If you need to apply the same filter multiple times over different images, construct the LPIFilter2D and specify it here. 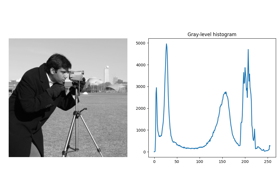 Ratio between power spectrum of noise and undegraded image. Input image (grayscale or color) to filter. The mode parameter determines how the array borders are handled, where cval is the value when mode is equal to ‘constant’. Default is ‘nearest’. Whether the last axis of the image is to be interpreted as multiple channels. If True, each channel is filtered separately (channels are not mixed together). Only 3 channels are supported. If None , the function will attempt to guess this, and raise a warning if ambiguous, when the array has shape (M, N, 3). Truncate the filter at this many standard deviations. This function is a wrapper around scipy.ndi.gaussian_filter(). Integer arrays are converted to float. If None, a new array is allocated. Deprecated since version 0.16: mask is deprecated in 0.16 and will be removed 0.17. Offset added to the structuring element center point. Shift is bounded by the structuring element sizes (center must be inside the given structuring element). Only valid when behavior='rank'. Deprecated since version 0.16: shift_x and shift_y are deprecated in 0.16 and will be removed in 0.17. New in version 0.15: mode is used when behavior='ndimage'. New in version 0.15: cval was added in 0.15 is used when behavior='ndimage'. Either to use the old behavior (i.e., < 0.15) or the new behavior. The old behavior will call the skimage.filters.rank.median(). 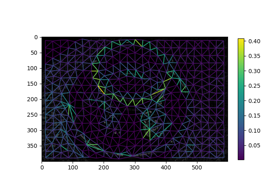 The new behavior will call the scipy.ndimage.median_filter(). Default is ‘rank’. Rank-based implementation of the median filtering offering more flexibility with additional parameters but dedicated for unsigned integer images. An optional mask to limit the application to a certain area. Note that pixels surrounding masked regions are also masked to prevent masked regions from affecting the result. Take the square root of the sum of the squares of the horizontal and vertical Sobels to get a magnitude that’s somewhat insensitive to direction. The 3x3 convolution kernel used in the horizontal and vertical Sobels is an approximation of the gradient of the image (with some slight blurring since 9 pixels are used to compute the gradient at a given pixel). As an approximation of the gradient, the Sobel operator is not completely rotation-invariant. The Scharr operator should be used for a better rotation invariance. 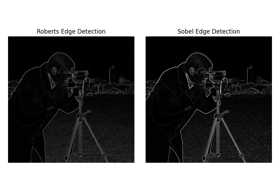 Note that scipy.ndimage.sobel returns a directional Sobel which has to be further processed to perform edge detection. Take the square root of the sum of the squares of the horizontal and vertical Scharrs to get a magnitude that is somewhat insensitive to direction. The Scharr operator has a better rotation invariance than other edge filters such as the Sobel or the Prewitt operators. D. Kroon, 2009, Short Paper University Twente, Numerical Optimization of Kernel Based Image Derivatives. Return the square root of the sum of squares of the horizontal and vertical Prewitt transforms. The edge magnitude depends slightly on edge directions, since the approximation of the gradient operator by the Prewitt operator is not completely rotation invariant. For a better rotation invariance, the Scharr operator should be used. The Sobel operator has a better rotation invariance than the Prewitt operator, but a worse rotation invariance than the Scharr operator. The Roberts’ Cross edge map. The kernel is applied to the input image to produce separate measurements of the gradient component one orientation. Define the size of the discrete Laplacian operator such that it will have a size of (ksize,) * image.ndim. 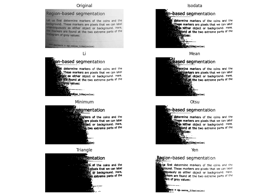 The Laplacian operator is generated using the function skimage.restoration.uft.laplacian(). New array where each pixel has the rank-order value of the corresponding pixel in image . Pixel values are between 0 and n - 1, where n is the number of distinct unique values in image . Gabor kernel is a Gaussian kernel modulated by a complex harmonic function. Harmonic function consists of an imaginary sine function and a real cosine function. Spatial frequency is inversely proportional to the wavelength of the harmonic and to the standard deviation of a Gaussian kernel. The bandwidth is also inversely proportional to the standard deviation. Spatial frequency of the harmonic function. Specified in pixels. Orientation in radians. If 0, the harmonic is in the x-direction. The bandwidth captured by the filter. For fixed bandwidth, sigma_x and sigma_y will decrease with increasing frequency. This value is ignored if sigma_x and sigma_y are set by the user. Standard deviation in x- and y-directions. These directions apply to the kernel before rotation. If theta = pi/2 , then the kernel is rotated 90 degrees so that sigma_x controls the vertical direction. Phase offset of harmonic function in radians. Gabor filter is a linear filter with a Gaussian kernel which is modulated by a sinusoidal plane wave. Frequency and orientation representations of the Gabor filter are similar to those of the human visual system. Gabor filter banks are commonly used in computer vision and image processing. 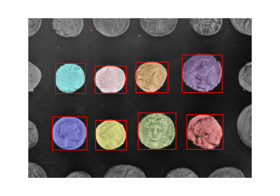 They are especially suitable for edge detection and texture classification. The linear size of the kernel is n_stds (3 by default) standard deviations. Value to fill past edges of input if mode of convolution is ‘constant’. The parameter is passed to ndi.convolve . 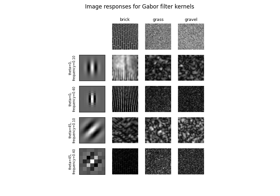 Filtered images using the real and imaginary parts of the Gabor filter kernel. Images are of the same dimensions as the input one. Print function name for each method. This filter can be used to detect continuous ridges, e.g. neurites, wrinkles, rivers. 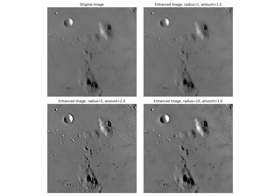 It can be used to calculate the fraction of the whole image containing such objects. Calculates the eigenvectors of the Hessian to compute the similarity of an image region to neurites, according to the method described in . Array with input image data. Frangi correction constant that adjusts the filter’s sensitivity to deviation from a plate-like structure. When True (the default), the filter detects black ridges; when False, it detects white ridges. Filtered image (maximum of pixels across all scales). This filter can be used to detect continuous ridges, e.g. tubes, wrinkles, rivers. It can be used to calculate the fraction of the whole image containing such objects. Defined only for 2-D and 3-D images. Calculates the eigenvectors of the Hessian to compute the similarity of an image region to tubes, according to the method described in . Sigmas used as scales of filter. This filter can be used to detect continuous ridges, e.g. vessels, wrinkles, rivers. It can be used to calculate the fraction of the whole image containing such objects. Defined only for 2-D and 3-D images. Calculates the eigenvectors of the Hessian to compute the similarity of an image region to vessels, according to the method described in . The range of sigmas used. Frangi correction constant that adjusts the filter’s sensitivity to deviation from a blob-like structure. Frangi correction constant that adjusts the filter’s sensitivity to areas of high variance/texture/structure. Kroon, D. J.: Hessian based Frangi vesselness filter. This filter can be used to detect continuous edges, e.g. vessels, wrinkles, rivers. It can be used to calculate the fraction of the whole image containing such objects. Defined only for 2-D and 3-D images. Almost equal to Frangi filter, but uses alternative method of smoothing. Refer to  to find the differences between Frangi and Hessian filters. Number of bins used to calculate histogram. This value is ignored for integer arrays. Upper threshold value. All pixels with an intensity higher than this value are assumed to be foreground. If image only contains a single grayscale value. The input image must be grayscale. That is, returned thresholds are intensities that separate the image into two groups of pixels, where the threshold intensity is midway between the mean intensities of these groups. For integer images, the above equality holds to within one; for floating- point images, the equality holds to within the histogram bin-width. If False (default), return only the lowest threshold that satisfies the above equality. If True, return all valid thresholds. Finish the computation when the change in the threshold in an iteration is less than this value. By default, this is half the smallest difference between intensity values in image. Also known as adaptive or dynamic thresholding. The threshold value is the weighted mean for the local neighborhood of a pixel subtracted by a constant. Alternatively the threshold can be determined dynamically by a given function, using the ‘generic’ method. Odd size of pixel neighborhood which is used to calculate the threshold value (e.g. 3, 5, 7, …, 21, …). 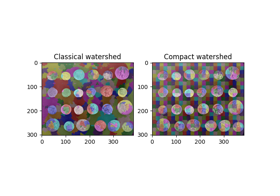 Method used to determine adaptive threshold for local neighbourhood in weighted mean image. By default the ‘gaussian’ method is used. Constant subtracted from weighted mean of neighborhood to calculate the local threshold value. Default offset is 0. The mode parameter determines how the array borders are handled, where cval is the value when mode is equal to ‘constant’. Default is ‘reflect’. Either specify sigma for ‘gaussian’ method or function object for ‘generic’ method. This functions takes the flat array of local neighbourhood as a single argument and returns the calculated threshold for the centre pixel. Threshold image. All pixels in the input image higher than the corresponding pixel in the threshold image are considered foreground. 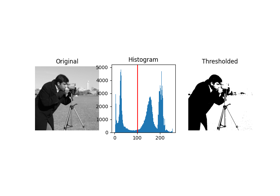 The histogram of the input image is computed and smoothed until there are only two maxima. Then the minimum in between is the threshold value. Maximum number of iterations to smooth the histogram. If unable to find two local maxima in the histogram or if the smoothing takes more than 1e4 iterations. C. A. Glasbey, “An analysis of histogram-based thresholding algorithms,” CVGIP: Graphical Models and Image Processing, vol. 55, pp. 532-537, 1993.
where m(x,y) and s(x,y) are the mean and standard deviation of pixel (x,y) neighborhood defined by a rectangular window with size w times w centered around the pixel. k is a configurable parameter that weights the effect of standard deviation. Window size specified as a single odd integer (3, 5, 7, …), or an iterable of length image.ndim containing only odd integers (e.g. (1, 5, 5)). Value of parameter k in threshold formula. Threshold mask. All pixels with an intensity higher than this value are assumed to be foreground. This algorithm is originally designed for text recognition. Applies Sauvola local threshold to an array. Sauvola is a modification of Niblack technique. where m(x,y) and s(x,y) are the mean and standard deviation of pixel (x,y) neighborhood defined by a rectangular window with size w times w centered around the pixel. k is a configurable parameter that weights the effect of standard deviation. 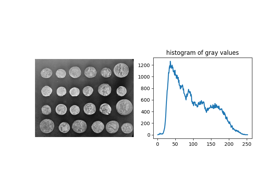 R is the maximum standard deviation of a greyscale image. Value of the positive parameter k.
Value of R, the dynamic range of standard deviation. If None, set to the half of the image dtype range. 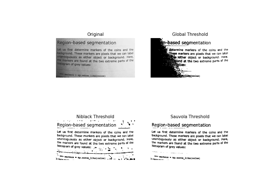 This algorithm finds regions where image is greater than high OR image is greater than low and that region is connected to a region greater than high . Array in which True indicates the locations where image was above the hysteresis threshold. The sharp details are identified as the difference between the original image and its blurred version. These details are then scaled, and added back to the original image. If a scalar is given, then its value is used for all dimensions. If sequence is given, then there must be exactly one radius for each dimension except the last dimension for multichannel images. Note that 0 radius means no blurring, and negative values are not allowed. The details will be amplified with this factor. The factor could be 0 or negative. Typically, it is a small positive number, e.g. 1.0. 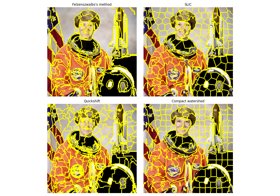 If True, the last image dimension is considered as a color channel, otherwise as spatial. Color channels are processed individually. Image with unsharp mask applied. Unsharp masking is an image sharpening technique. It is a linear image operation, and numerically stable, unlike deconvolution which is an ill-posed problem. 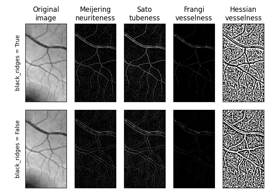 Because of this stability, it is often preferred over deconvolution. 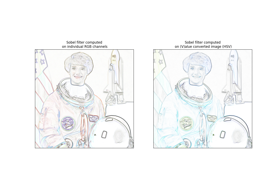 When applying this filter to several color layers independently, color bleeding may occur. More visually pleasing result can be achieved by processing only the brightness/lightness/intensity channel in a suitable color space such as HSV, HSL, YUV, or YCbCr. Unsharp masking is described in most introductory digital image processing books. This implementation is based on . Function that yields the impulse response. r and c are 1-dimensional vectors that represent row and column positions, in other words coordinates are (r,c),(r,c) etc. **filter_params are passed through. Gaussian filter: Use a 1-D gaussian in each direction without normalization coefficients.